Lukuru Foundation, Knoxville Zoo, Kenya Wildlife Service, Pandrillus Foundation, Last Great Ape Organization, Limbe Wildlife Centre, Lwiro Primate Rehabilitation Centre, Uganda Wildlife Education Centre, Disney Wildlife Rapid Response, Born Free Foundation, WWF Cameroon, Natural Encounters, Inc., Dees Family Foundation, Phoenix Landing Foundation, Columbus Zoo, Woburn Safari Park, Humane Society of the US (HSUS), Isdell Family Foundation, RSPCA, Pro Wildlife, Pan African Sanctuary Alliance (PASA), Ngamba Island Chimpanzee Sanctuary, Wildlife Conservation Society-Congo, Uganda Wildlife Authority, Bulgarian Ministry of Environment and Waters, MAYA, World Animal Protection (WAP). Formerly widespread over much of tropical Africa, Grey Parrots (Psittacus erithacus) have disappeared from many range countries. Progress and outcomes: Beginning in 2001, WPT has supported ongoing studies on Grey Parrot behaviour and the effects of trade. To date, the Trust has assisted with the confiscation and rescue of thousands of Grey Parrots (see Species Info tab). In the last few years, WPT has launched two petitions to call on CITES to suspend the export of Grey Parrots from Congo and Cameroon. On October 2, 2016 after more than five years of collaboration with field partners, a petition with 75,000 signatures and new field data were presented at the Conference of the Parties for CITES 17. 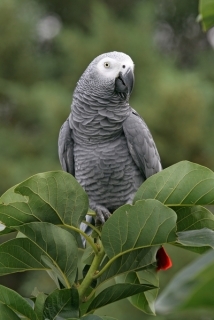 Delegates voted by a wide margin to uplist both Grey and Timneh parrots to Appendix I, ending commercial trade in wild birds. In December 2016, the species was uplisted by IUCN to Endangered. Building on these positive developments, in 2017 WPT focused its efforts in continuing to monitor the trade situation and supplying enforcement agencies with information so that they could take action. Shipments of birds from Central Africa (the main source of Grey Parrots) into Pakistan (one of the main importers) have all but stopped since June 2017. WPT's capacity to track illegal trafficking was increased through a new collaboration with World Animal Protection (WAP), who has funded WPT's monitoring of trade on social media. WPT’s participation in a new project in Angola, partnering with their national government, US Fish and Wildlife Service, and Wildlife Impact (WI), is building capacity and providing training to local staff in the care of rescued Greys. New work in Nigeria has uncovered a large roost protected inside a palm plantation; future studies will focus on the relationship between Greys and these plantations. In 2018, WPT's work focuses on Nigeria, the Democratic Republic of Congo, Angola and Tanzania. With your help we can better understand the ecology and threats to Grey parrots and work for their protection. Where found: The Grey Parrot is found in S Nigeria, S Central African Republic, Republic of Congo, DRC, Gabon, Equatorial Guinea, SE Ivory Coast, N Angola, S Democratic Republic of Congo, NW Tanzania, W Kenya, W Uganda, Principe and Bioko Islands. History: Formerly widespread over much of Africa, Grey and Timneh parrots are now threatened throughout much of their natural ranges by extensive deforestation, particularly in W Africa, and heavy trapping for the wild bird trade. Both species (recently split from Psittacus erithacus to P. erithacus and P. timneh) have been uplisted on the IUCN Red List to Endangered in the wild on the basis of rapid population declines over three generations (47 years). Decreases have been noted in Burundi, Cameroon, Ghana, Kenya, Nigeria, Rwanda, São Tomé and Príncipe, Togo, Uganda and parts of Congo and the Democratic Republic of the Congo. Over 1.2 million wild-caught individuals of mostly P. erithacus entered international trade in four decades. Taking into account a mortality rate of 40-60% the true number trapped could be upwards of 3 million. Ecology: Grey Parrots are found in primary and secondary rainforest, forest edges and clearings, gallery forest and mangroves; also wooded savanna, cultivated land and some gardens, up to an altitude of 2200m (7216 ft). They eat a variety of seeds, nuts, fruits and berries and some cultivated maize, usually feeding at tops of trees. They are gregarious, forming large communal flocks of over 1000 individuals, roosting in palms over water or on islands in rivers. Since 2007, WPT has assisted with 5 seizures of Grey Parrots totaling more than 3000 birds. Aid provided included advising on the care, housing, rehab and reintroduction of the birds, sending funds for new enclosures, and sending in a veterinary team to assess the overall health of the birds. In November 2011, about 160 Greys were confiscated by police in the Republic of Congo and taken to the Wildlife Conservation Society (WCS) field camp in Kabo. The World Parrot Trust was contacted shortly after, and provided advice on treatments, housing and diet. In early 2012, WCS-Congo decided to reassess the condition of the parrots to see how many were ready to be released. They asked WPT to send an avian specialist to Congo to assist them. On March 15th, Dr. Davide De Guz, of the World Parrot Trust Field Veterinary Team, flew to Brazzaville, Congo. On their arrival in Kabo they found that some of the birds were ready to be released, and others needed further health tests and repair to damaged feathers. Dr. De Guz and Dr. Ken Cameron of WCS were able to release all but about 60 of the parrots in late March. It was the first time confiscated Grey parrots were rehabilitated and released in Congo-Brazzaville. In 2010 WPT assisted with the confiscation of 500 Grey parrots, providing guidance on care and rehabilitation for release into the wild. Unfortunately corrupt government officials seized the birds before they could be released and returned them to bird traders. WPT responded by alerting all appropriate agencies to try to secure them. WPT funded the training of a customs veterinarian for Nairobi Airport to identify instances where birds are being smuggled through security. Within 2 months of finishing his training 25 parrots were seized. WPT also supported a meeting of personnel from key agencies to discuss the situation with the trade in Greys. Agencies represented included: National Museums of Kenya, Kenya Wildlife Service, Kenya Forest Service, Kenya Society for the Protection and Care of Animals, Kenya Airports Authority, Nature Kenya and Kakamega Environmental Education Programme. In Calabar, Nigeria July 2013 officals confiscated 96 Grey parrots that had been smuggled from Cameroon on their way to being sold outside of Africa. They were transferred to the Pandrillus Foundation compound in Calabar. WPT sent funds to help with the housing and rehabilitation of the birds. 700 illegally caught Greys died in airline transit from DRC to South Africa. Follow up and media glare focused by Dr. Steve Boyes within the country led to a temporary ban on all incoming imports of Greys (affecting probably 5000 birds annually). In a separate incident, 150 Greys were confiscated at a border crossing from the DRC. The birds were taken to a quarantine facility in Johannesburg. Unfortunately WPT later learned that the public prosecutor decided to hand the birds over to a bird trader from Mozambique, even though there was no proof that the man had ownership of the birds. WPT assisted with two seizures of 250 Grey parrots. Technical and logistical support was supplied, in addition to a community education program to raise awareness of conservation issues. In 2013 renowned primatologist and conservationist Dr. Jane Goodall assisted with the release into the wild of seventeen Grey parrots confiscated in Bulgaria three years prior, sent to Sofia Zoo and rehabilitated at Uganda's Ngamba Island Sanctuary in preparation for release. WPT has taken part in the rescue of a number of Greys confiscated in the EU, mobilising their care, treatment and transport to various zoos and sanctuaries.